Is Cinnamon the Healthiest of All Spices? Whenever the scent of cinnamon wafts through my house, it is sure to bring family members into the kitchen to see what’s cooking. But my family doesn’t know my healthy little secret: Cinnamon not only smells and tastes good, it’s good for you, too. Sprinkling a little cinnamon into your foods and beverages over the course of a day helps your body increase insulin function and also delays stomach emptying, which leads to a decreased glycemic load. New research provides empirical evidence of this effect, where previous studies had merely reported that it seemed so. To learn more about this, I contacted study author Joanna Hlebowicz, MD, at the University of Lund in Sweden. Using ultrasound imaging, Dr. Hlebowicz and her colleagues measured the gastric emptying rate (GER) — how fast food empties from the stomach and enters the small intestine — of 14 healthy people after they ate an un-spiced bowl of rice pudding, and also after they ate a bowl of rice pudding to which six grams (a little less than 1 1/3 teaspoons) of cinnamon had been added. They found that cinnamon significantly delayed gastric emptying and lowered after-eating blood sugar levels. The reason this is so important is that gastric emptying, among other factors, affects the post-meal glucose, explains Dr. Hlebowicz. Since past research has shown that high levels of glucose following meals may be linked with a higher risk of diabetes complications such as cardiovascular disease, finding a simple way to lower it and thus lower post-meal blood glucose levels — such as adding cinnamon to your diet — is a good idea. Fortunately, there are plenty of delicious ways to incorporate more cinnamon into your daily diet. Cinnamon tea is delicious, for one. 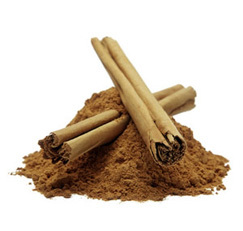 And, besides flavoring many sweet treats, cinnamon is a tasty ingredient for chicken, meat and fish dishes. Many recipe ideas can be found at McCormick.com. Source: Joanna Hlebowicz, MD, department of medicine, Malmo University Hospital, University of Lund, Lund, Sweden.